In 1819, Alabama became the 22nd state - but it's "first" in a bunch of other areas. Although it's typically identified with New Orleans, it was Alabama that introduced Mardi Gras to the Western world. The first electric trolley system debuted in Montgomery in 1886, and the first open heart surgery in the West was performed in 1902 in that city. Workers in Huntsville built the first rocket that helped put man on the moon (for that reason, the city is known as the Rocket Capital of the World). Throw in tons of history, famous citizens like Willie Mays and Nat "King" Cole, and of course, sweet tea - and you've got a state with plenty of interest. Here are 20 of the coolest things to check out in Alabama. It served as the home for Dr. Martin Luther King, Jr. in Montgomery when he was a pastor in that city. The tour provides an intriguing look at the early moments of the Civil Rights Movement and Dr. King's role in it. The state has serious blooms in the springtime, and the Garden Trail is a great way to take it all in. Different locations provide a variety of stunning foliage and landscapes, from one end of Alabama to the other. 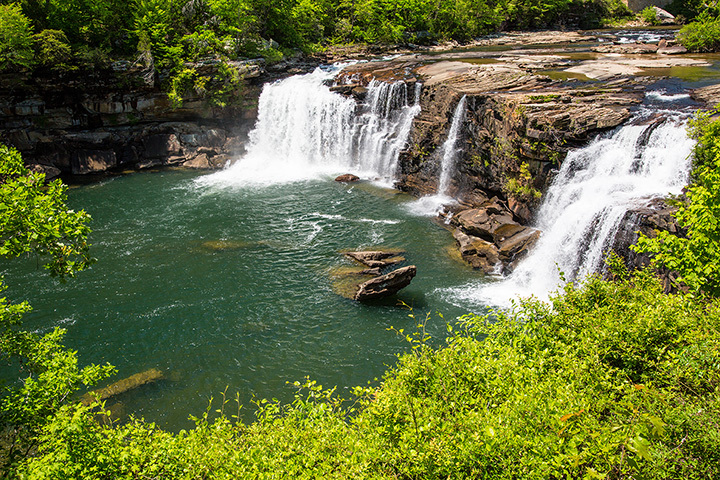 Beautiful hiking trails, scenic overlooks, waterfalls, swimming holes and all-around stupendous beauty. When you're looking to welcome spring, you could do worse than this fantastic park. The highest point in the state (there's a mountaintop involved) offers some serene opportunities for hiking, biking, camping and more. If you appreciate beautiful scenery, you must put this on your list. Whether it's the displays of rockets, the simulations of blast-offs, what it's like to be inside the Space Shuttle, or Space Camp, get ready to embrace your inner astronaut and go where no man/woman has gone before. It's a Mardi Gras mecca, with displays of elaborate costumes, memorabilia and photos (going back to 1886) from celebrations past. Pick up a hat or mask at the gift shop, and get in that carnival mood! When she refused to move to the back of the bus, she helped spark a movement. This wonderful museum gives a sense of what she risked, and the impact of her courage. This slightly out-of-the-way gem holds several world records (such as Largest Natural Opening) and is a beautiful way to spend a day out of the Southern heat. Take the 90-minute tour and get your geology on. The Gulf Coast beaches of Alabama are famous for their soft, white sands and clear waters. Doesn't get much better than that. For a few months in 1861, this was where Jefferson Davis and his family lived - and was the defacto home of the Confederacy. There are still many period furnishings, as well as artifacts from the Davis family. For nearly a century, the furnaces turned the nearby raw materials into pig iron. Since its closing in the 1970s, the furnaces have become a popular destination for photographers - not to mention, ghost hunters who want to investigate the many reports of apparitions and unexplained voices. During the early 1930s, one of America's great writers lived here with his wife and daughter (Zelda was a Montgomery native). The home is a tribute to their time in the area, with plenty of photos, personal items, books and letters on display. For those with a taste for hunting, Alabama offers numerous possibilities. In the fall, you can bag your limit on squirrels, quail, rabbits, feral hogs, deer and more. There are 1.3 million acres of public hunting lands - and the season lasts a bit longer than in other states. So get your hunting gear oiled up and ready. This annual festival showcases everything Native American, from stone carving to silversmith work, bead working and many more things related to the culture. You can also watch as tribes demonstrate flute playing and traditional dances. Hard to believe, but there IS skiing in Alabama. Cloudmont Resort in Mentone is spread over 800 acres of mountaintop - and uses snowmaking equipment to help out when Mother Nature isn't cooperating. Since 1970, it's been a key destination for those seeking a winter respite. Yes, it's a dazzling display of holiday lights (over a million of them) - in all sorts of themes. But what makes this event at the Oak Mountain Amphitheater even more fun is that you can tune your car radio to pick up synchronized music to view them by. Only in a place like Alabama can you do some great fishing during the winter months. Gulf State Park Pier is the second-longest pier in the Gulf of Mexico, and gives you plenty of chances to catch some prime fish. Several nearby restaurants will even cook 'em up for your dinner. It's probably one of the weirdest places to do your holiday shopping - but you never know what you'll find. Tons of unclaimed bags from the airlines wind up here, and everything is for sale.